The wise men came to Jerusalem during the time when Herod was king. One thing that Herod did not want was competition. When these wise men showed up in Jerusalem, it created quite a stir and Herod had his curiosity peaked. How many wise men were there? Three, you say. Well, read the verse again. It doesn’t say there were three. We get that from Christmas cards and the songs of Christmas. 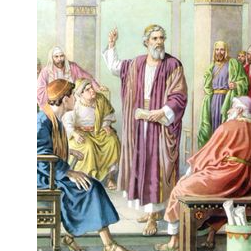 The Bible doesn’t say how many wise men came to Jerusalem. I will not speculate about how many wise men there were, but I don’t believe that three would have disturbed Herod or excited Jerusalem, however three hundred probably would. These men came from the east, but from different areas. They had been studying the stars and they came together when this very unusual star appeared and they followed it to Jerusalem. They came looking for a king, and it wasn’t Herod, and that upset him. “We saw His star in the east.” The star was in the west; the wise men were in the east. The star was in the west and when they followed it they traveled west. If they would have traveled east they may have ended up in India or China. The question that I have is how did they associate the star with a king and how did they tie this to Israel? One explanation may be, that in the section of the east that they came from, they knew the prophesy given by Baalam that is recorded in Numbers 24:17, “I see Him, but not now; I behold Him; but not near. A star will come out of Jacob; a Scepter will rise out of Israel. He will crush the foreheads of Moab, the skulls of all the sons of Sheth.” The star that will come out of Jacob is the nation of Israel. The “Scepter that will rise out of Israel” is a king. The star is mentioned along with the Scepter. The wise men came seeking a king and that disturbed Herod. We know why Herod was disturbed; it was because there might be a rival for his throne and he must find him and eliminate the threat to his position. But why was all Jerusalem disturbed? It was probably just curiosity or maybe they hoped to get rid of Herod. Herod was a very superstitious man and all his family was scoundrels. They were like the first century Mafia, but Herod was the worst of the lot. He was not even an Israelite, he was an Idumean who bought his position from the Roman government. The Scribes knew where the Messiah would be born. They didn’t have to go search the scriptures; they could quote from memory Micah 5:2, “But you Bethlehem Ephrathah, though you are small among the clans of Judah, out of you will come for Me one who will be ruler over Israel, whose origins are from old, from ancient times.” They had so much knowledge of scripture and they were looking for the Messiah, so why didn’t they ask to go with the wise men? I believe it was because their knowledge was academic; it was not vital to them and it was not personally meaningful. How many people are like that today? They study the Bible and they take great pride in what they know. But they are not looking forward to His return. They would like for Jesus to delay His return, because they like their life the way it is.